I love books, so it stands to reason that I love books about books, like David Whitehouse's Mobile Library. Twelve-year-old Bobby lives with his horrible dad and his dad's girlfriend, waiting for his mum to come home. Needing protection from the bullies at school, Bobby befriends Sonny, who is soon taken away from him. Just when he needs friendship and love the most, he meets Rosa and her mum Val, who is a cleaner in a mobile library. The books in the library provide Bobby with an escape, but he, Rosa and Val soon need to use the mobile library to physically escape, heading off on an adventure of the type you only read about in books. 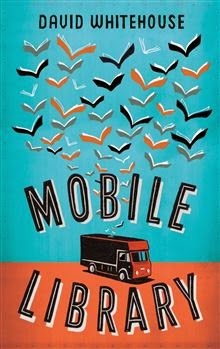 Mobile Library is an absolutely charming book, full of flawed but loveable characters. Its central storyline is just one part of the book, Mobile Library is also an homage to great books and the escape they provide. Whitehouse's story is about the power of stories and about believing in the impossible (it might not always work out, but sometimes the impossible can come true). Bobby is a wonderful protagonist, at once a sweet, hugely naive child and a wise old man, albeit not in age. He's appealing because he's a good kid dealt many bad hands, and when he finally finds people who appreciate him and love him unconditionally, you're genuinely happy for him. Val and Rosa provide Bobby with what is missing, and he also fills a gap in their lives, of brother, of friend, and of protector. Whitehouse's tale is heartwarming but filled with heartstopping moments, soothing yet surprising, and filled with tales of human goodness, as well as human foibles. It's a book about great books, a modern version of the adventure tales namechecked in its pages, and will make you wish you could go on an adventure in a mobile library. •Mobile Library is out on January 15, 2015. How I got this book: From the publisher, Picador. This did not affect my review.